For details regarding these Dual Admission and Reverse Transfer Agreements or should you have any questions about transferring to BU, please feel free to contact Maramonne Houseknecht at mhousekn@bloomu.edu. 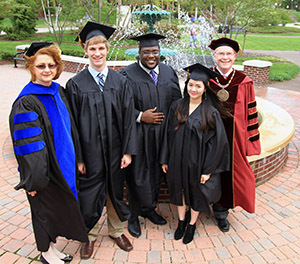 Bloomsburg University has partnered with community and two-year colleges within Pennsylvania in order to implement a Dual Admission program that facilitate a seamless process for bachelor degree completion for community and two-year college students. BU’s Dual Admission Agreements are designed to assist the student to transfer into a parallel major degree program at BU without loss of credit, time, or money. In fact, completing the associate degree and transferring under this agreement usually saves the student money! Applying for dual admission is easy! Just click on the Dual Admission Agreement link in the right hand box on this page, complete the application for dual admission and return it to your community college office listed on the application. Should you have any questions about these agreements, please contact Maramonne Houseknecht at mhousekn@bloomu.edu. BU has partnered with Community Colleges to create a Reverse Transfer Program that offers eligible students, who transferred from their Community College to BU before earning an associate degree, the opportunity to transfer BU credits back to Community College to fulfill their Community College’s degree requirements and earn their associate degree. For more information on this program please click the Reverse Transfer page.